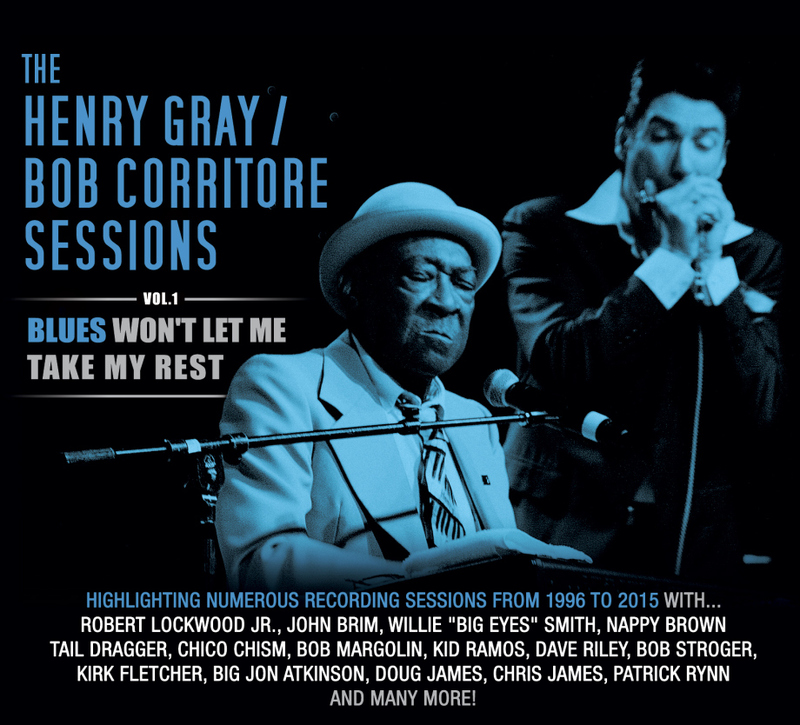 I just received the newest release, Blues Won't Let Me take My Rest from Henry Gray and Bob Corritore. 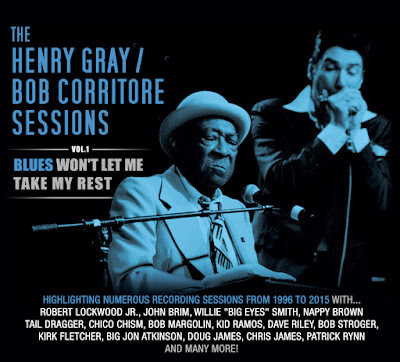 Featuring 10 previously unreleased out of 14 included tracks, this release features not only Gray and Corritore, but many other of the greats in recent blues history. Opening with Let's Get High, a great piano shuffle with Gray on lead vocal backed by Willie "Big Eyes" Smith on backing vocal and drums and Corritore on harp, this is a great opener. Gray's vocals on Blues Won't Let Me Take My Rest are a stark contrast to Clapton but this is real and Gray's piano with Corritore on shielded harp, Bob Margolin and Johnny Rapp on guitar and Chico Chism on drums, this sounds a lot like Muddy's band. New Orleans flavored boogie, I'm In Love Again features a cool harp riff by Corritore and hot guitar riffs by Rapp. Robert Jr Lockwood is featured on vocal and guitar on Robert Johnson's Ramblin' On My Mind, one of my favorite tracks on the release. Big Maceo's Worried Life Blues, feature Nappy Brown on lead vocal but Gray's piano work is solid and unmistakable. Gray is in top form on vocal on They Raided The Joint, joined by Kid Ramos on guitar, Corritore on harp, Paul Thomas on bass and Chism on drums. Very cool! Dave Riley takes the lead vocal spot on Ride With Your Daddy Tonight joined by Chris James on guitar, Yahni Yiley on bass and Eddie Kobek on drums. Corritore and Gray both do really nice jobs on this track making it one of the strongest instrumental tracks on the release. Lowell Fulsom's Trouble Blues, has a great feel with Rapp laying down some real nice slide over Gray's killer piano and vocal work. Excellent! Shuffle track, I'm Gonna Miss You, keeps Gray up front on piano and vocal. With extended harp work from Corritore, Steve Cushing on drum and, Paul Thomas on bass this track, Rapp steps up again with some pretty cool riffs on guitar. John Brim's That Ain't Right features Brim himself on the mic backed by Troy Sandow on bass and Big John Atkinson on drums. Corritore keeps up the heat but this track really shows how nicely Gray can hit the groove on piano. Ernest Lawler's Can't Afford To Do It has Gray back on lead vocal backed by Little Frank, Danny Michael and Big John on guitar, Sandow on bass and Brian Fahey on drums. One of the hottest tracks on the release is Boogie Woogie Ball, really giving Gray the open door to rock it and he really does. Corritore has strong continuity on harp throughout the track, Kirk Fletcher it tight on the beat with hot riffs backed by Patrick Rynn on bass and Brian Fahey on drums. Very cool! On laid back Honey Don't Let Me Go, Gray has the full focus with lead vocal and piano. Backed by Rapp on guitar, Thomas on bass and Cushing on drums, Corritore steps in for a nice harp solo balancing out the track nicely. Wrapping the release is BB King's She Don't Move Me No More featuring Gray on beautiful piano and lead vocal. I especially like Corritore's riffs on this track as well as Rapps tight guitar solos. Paul Thomas on bass and Chico Chism on drums round out the line up.